HONG KONG/HARBIN: At the Siberia Tiger Park in the frigid Chinese city of Harbin, visitors can learn about the facility’s successful breeding program and buy chicken carcasses to toss to around 20 tigers pacing the snow flecked ground of their enclosure. At the park gates, a shop sells liquor soaked with tiger bones for up to $1,000 a bottle. China has made significant strides in wildlife protection in recent years, including a total ban on ivory and plans to open one of the world’s largest reserves for wild tigers in northeast China in 2020. But it also has formidable, profit-driven wildlife business interests that risk undermining progress on protecting the endangered big cats, conservationists say. “The industry occupies a strategic position which concentrates in the country’s less developed regions where poverty reduction remains a top priority of the local authorities,” said Houston-based Peter Li, a China Policy Specialist at Humane Society International. Operators of tiger breeding farms have told state media that without the ability to sell bones, skins and meat they are not be able to cover the high costs of running their parks and carry out key conservation plans endorsed by the national government. After pressure from some breeders, China’s State Council said in October it would replace a 1993 ban on the trade of tiger bones and rhino horn, opening up exceptions under “special circumstances”, including medical research. But in November, Beijing postponed the move following widespread protests from conservation groups who worry any resumption in the legal trade of tiger parts will be a death knell for the species by enabling the laundering of wild animal parts into farmed supplies. Conservationists also argue that no captive Chinese bred tigers have been released into the wild and there is no scientific or medical need to use rhino horn and tiger bone in traditional Chinese medicine. Still, lifting the ban is backed by China’s powerful State Forestry and Grassland Administration. “If rhino horns and tiger bones can be used for medicinal purposes, and their use causes zero harm to the two endangered species in the wild, why should we oppose it?” Tang Xiaoping, an executive at the administration was quoted in the state-run China Daily newspaper. The Forestry and Grasslands administration did not respond to multiple requests for comment. At the Siberia Tiger Park, tiger bone wine is sold openly and is recognized by the Forestry Bureau and Commerce Ministry, according to a sales representative in the store. However, the park is not allowed to publicly promote it due to the sensitivity of the situation, the sales rep said. Officials at the park declined to comment on the record. The wine, which ranges in price from 280 yuan-6,888 yuan, ($40-$1,003) is displayed in large glass cabinets and also sold on China’s Twitter-like WeChat. Park executives, officials and conservation experts say tiger parks have been accumulating stocks of animal skin and bone in freezers, with the aim of selling it for medicinal use in thefuture. Conservation groups estimate there are now over 6,500 farmed tigers at some 200 facilities in China and around 40 farmed rhinos. Chinese media say tiger bone can fetch 5,000-9,000 yuan ($727-$1,308) per kg – tens of thousands of dollars per animal. The World Wildlife Fund believes there are only around 40-50 wild tigers left in China out of around 3,900 globally. Debate over lifting the ban on tiger trade comes as China seeks to develop its traditional medicine industry, worth some $50 billion annually, and position it as a key pillar of its ‘One Belt One Road’ strategy. The World Health Organisation is set to recognize traditional Chinese medicine for the first time next year in its global medical compendium according to Nature International Journal of Science, citing the governing body. The Siberian Tiger Park has more than 1,300 tigers spread across three locations. Selling tiger bone wine is a way to subsidize the daily expenses of the park, said one of the park’s tour guides. Currently, visitor fees are the parks’ main source of income, along with government subsidies. 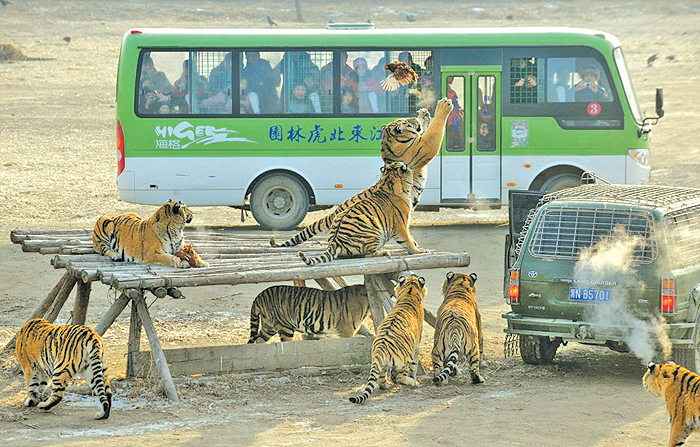 Ticket prices are 100 yuan and visitors can pay extra to feed the tigers. A menu of meat displays prices for a live chicken at 120 yuan while a raw cutlet is 10 yuan. In a CCTV documentary shown in November, Liu Dan, the chief engineer of the Northeast Tiger Forest park, near China’s border with Russia, says his 1,000-plus tigers each eat around 3,000 yuan ($435) worth of chicken per month. Liu, who has raised tigers for over 30 years and has repeatedly called for the ban on trading tiger parts to be lifted, told state media that government tax breaks are not enough for the park to be financially viable. Currently, parks make most of their money from visitors. Liu and the park declined to comment for this article.